In May this year Kate volunteered for The H.A.I.R Foundation charity. This is a new organisation to help homeless women. The concept is for hairdressers to offer their skills to help women regain their confidence and self-esteem in helping them to overcome personal trauma through experience of human trafficking, drug and alcohol abuse as well as physical and mental abuse. 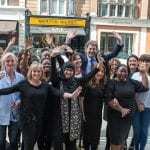 To kick start the initiative, Kate helped out at the first event in Martyn Maxey’s Salon in Marylebone, London. Kate offered haircuts throughout the day in a salon environment, with full consultations designed to give the women a voice and a choice. Martyn Maxey leads the organisation, he explains – ‘We are lucky to be able to make people feel special and beautiful simply with a pair of scissors. This is more than just a haircut, it is supporting women to take the steps they need to feel good about themselves and a valued member of society’. Kate thoroughly enjoyed the experience and hopes to attend a few more events this year for the charity!